Axial FLAIR shows an abnormal T2 hyperintensity involving mammillary bodies and hypothalamus support changes of Wernicke's Encephalopathy. 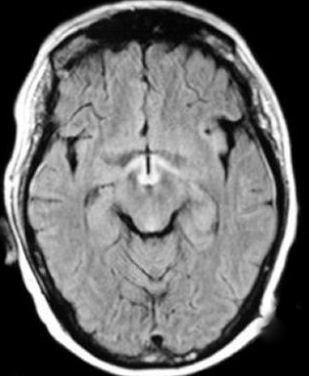 In WE, CT Brain is often normal. MRI is investigation of choice. Signal abnormality in peri aqueductal grey matter of mid brain, mammillary bodies, hypothalamus > para median portion of thalami is an imaging wise diagnostic clue. T2 hyperintensity on FLAIR and T2w images, may show restricted diffusion and contrast enhancement in corresponding region in acute stage. Clinically WE characterised by triad of Ataxia, Ophthalmoplegia (especially VI CN palsy) and Altered sensorium, all the three component may not be present every time in every patient depends on stage of the disease. Considered as a medical emergency. If left untreated coma and death may ensue. Respond very quickly and completely to thiamine supplementation. Thiamine deficiency impairs thamine dependent enzymes resulting in accumulation of Glutamate and cell damage. On microscopy there is axonal degeneration, demyelination and neuronal loss in affected areas. Thiamine deficiency commonly seen in alcoholics which contributes ~50 % of cases. Can occur in Non alcoholics even in children and causes include severe malnutrition, hyperalimentation.